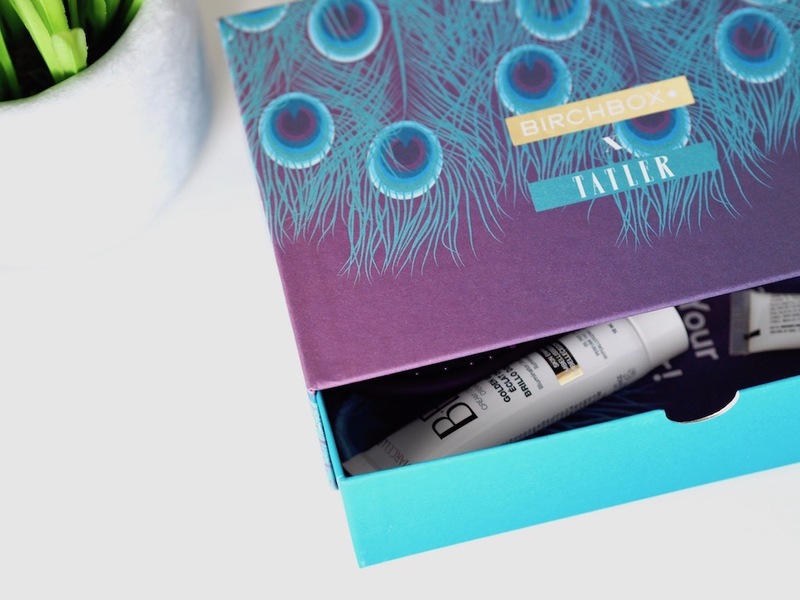 This isn’t your standard ‘November Birchbox’ review but more of a ‘Why you should jump on the beauty subscription box band wagon BIRCHBOX review!’. Bit of a mouthful but seeing as I have been a loyal subscriber to Birchbox for over 2 years now (shock) I felt it was time I put virtual pen to paper and give you the low down on possibly one of the best beauty sub boxes out there. SO WHAT IS A BEAUTY SUBSCRIPTION BOX? A super cute box of often 5-6 samples of beauty and sometimes lifestyle delights, delivered straight to your door for a fee each month. Throw in a detailed little booklet, that gives you all the deets and top tips about your new found beauty besties and you've got yourself a stairway to the kingdom of beauty discovery! BUT WHY BIRCHBOX WHEN THERE ARE SO MANY OTHERS? ones that I could have just bought from my local Asda, I got a bit agitated and abandoned ship. I need something that is going to pique my interest EVERY. SINGLE. TIME. And keep me coming back for more. 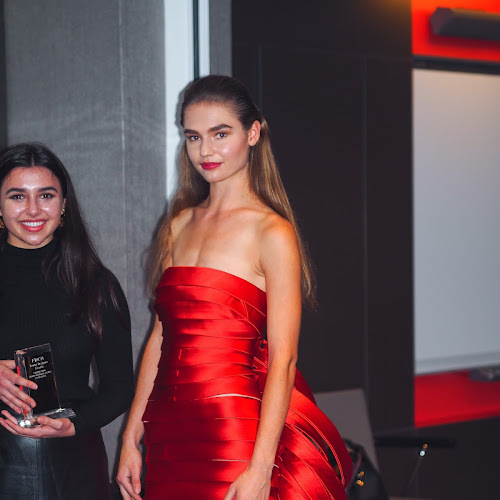 I want luxury, high end, lesser known, HOLY GRAIL beauty products that you would never have thought to buy before, let alone have discovered yourself. That’s where I find Birchbox hits the mark. I have discovered so many new brands and can’t live without products just from receiving their little box of goodies each month. 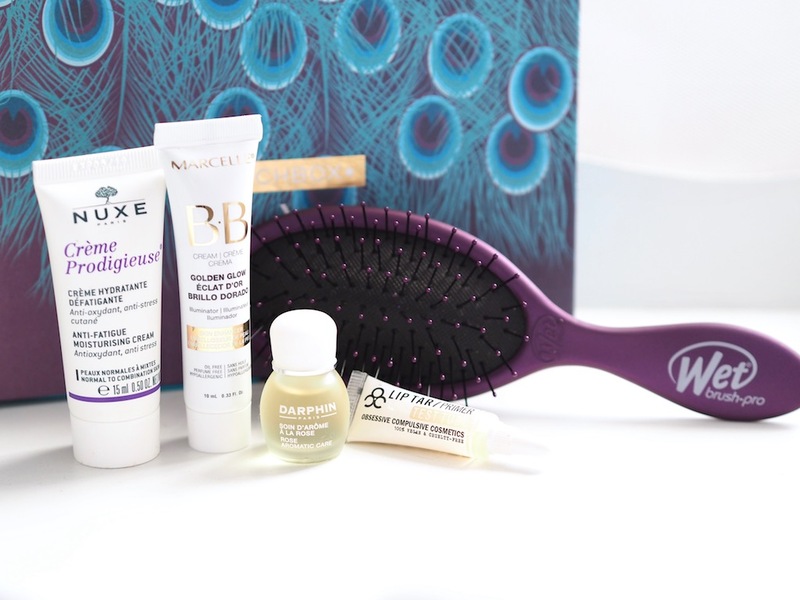 Plus the selection of brands that Birchbox work with is just getting better and better. 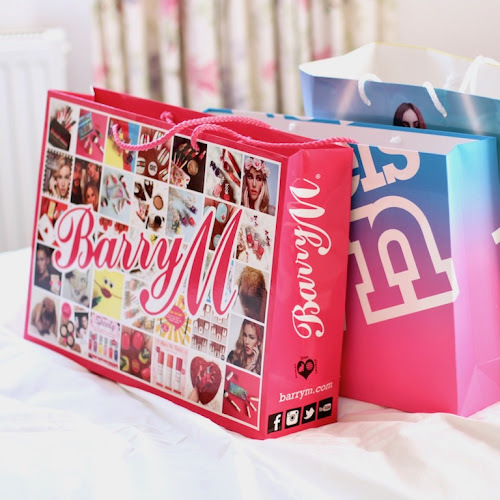 So at any time you could find a treat from one of these brands in your monthly box! In fact I discovered the infamous and original BeautyblenderTM from one of my very first boxes back in 2014. Discovered the most amazing Rituals orange zesty body scrub. The Liz Earle Cleanse and Polish hot cloth cleanser! A perfect match eyebrow gel by ModelsCo and one of the best fake tan brands I have ever come across, Vita Liberata. The list goes on and on, so many new cult beauty products I had never heard of before and brands that I had always wanted to try but couldn't as they were too expensive. Which is kind of the whole point of this subscription right?! only to find out you’re £40 down on a full size product that did not turn out to be a face lift in a bottle after all! So bring on the cute travel sized samples to help you decide if a product is worth splashing out on! So the deal is for £12.95 a month (£10 for the box & £2.95 postage) you will get 5 beauty products tailored to your own personal profile that you fill out when you sign up! Sometimes you receive a bonus 6th product too, it could be a full size beauty surprise or a lifestyle related gift! Every month is a super cute new box design. Lately they have been switching it up from their usual drawstring bags in a box and have started turning the boxes themselves into drawers! Even better for storing all of your beauty samples and secret stashes. Facial cleansing, body washes, moisturises, balms, makeup, hair care products and bath products. For example one day I opened up my box and saw a brown supposedly ‘super tie’ hair bobble in my box, I turned up my nose. Like why are they giving me a frickin’ HAIR TIE?! I could go to Primark and buy a pack of about 20 for £1!! But no joke when I say it has become the BEST hair bobble I have ever used in my life, super stretchy and strong, still not lost its shape and closely matches my hair colour. My sister pulled the same face when she found one of these in her box a few months ago and I told her it was the best damn hair tie… She still uses hers almost every day. Their rewards scheme is LEGEN---Wait for it--- DARY! LEGENDARY. So you have your Boots card where you can gain about 4 points per £1 spent, then Superdrug, which is it me or does that seem to take FOREVER to build up anything on there!? I buy so much stuff in that place and every time I get a receipt I’m still only on about £1.52 in points. WHY, WHY?! I give you so much money!! So think about it, 6 mini satisfaction surveys to fill out about your box and the products. 6 x 8 = 48, which in Birchbox land is £4.80! You also gain points for buying products from the online shop and referring friends. you do have to be on a multiple of 100 to be able to spend but they build up so quickly that before you know it you’ve got 326 points, an equivalent of £30 to spend in the shop! Which is super useful when my favourite Caudalie Micellar cleansing water is £15 and my favourite Vita Liberata pHenomenal 2-3 week tan is £37.50. Let the points build up and you can practically buy these items for next to nothing! I also referred a couple of people to Birchbox once using a unique link that I can give out and I got 50 points for each referral (which is £5) and one of my boxes for free! I also received a super cute rose gold bracelet one month as I had referred a friend within a certain time period. It’s fabulous little rewards and extras like these that keep me a happy bunny and continuing with that auto renewal! SIGN UP HERE USING MY UNIQUE REFERRAL LINK AND RECIVE £5 OFF YOUR FIRST BOX! Ok ok so I’ve thrown you the sales pitch but what about the products you received this month I hear you scream?! 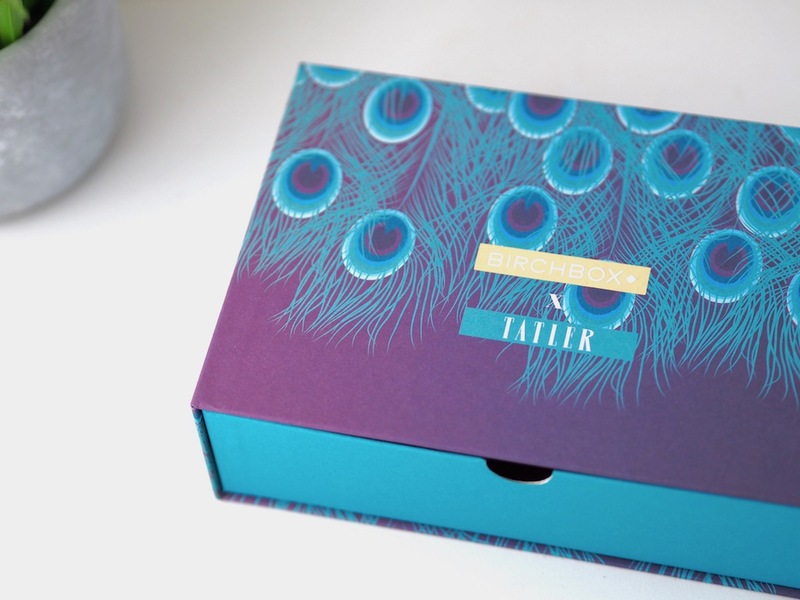 The November box is in association with Tatler magazine and they have specially curated this box designed around the party season! The peacock detailing on the box is to die for and the selection of products looks pretty promising! Now admittedly this month when I opened up my box and saw a hairbrush I had a similar snort of derision to when I saw the hair tie, but I thought hey this could end up being the best damn brush I have ever owned! Give it a chance. 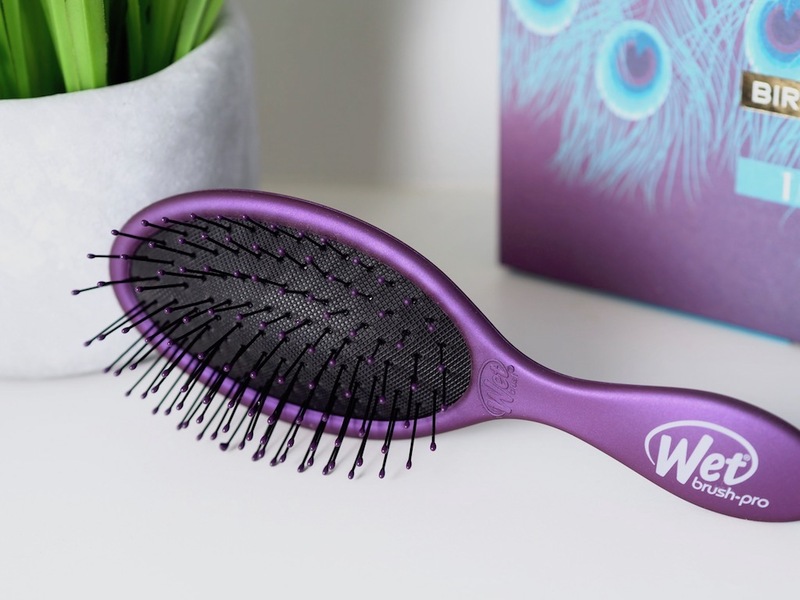 The bristles are actually super soft and quite malleable in comparison to most brushes, hence why it is probably called the Wet to dry brush as you can easily use this on your precious damp hair. It’s also the perfect size for travel and popping into your handbag. My sister got one of these brushes in her box too but hers was purple and mine was blue, luckily we both preferred each other’s so we swapped! Perks of having a sister who also gets Birchbox, we get any products we don’t like… we can always swap! 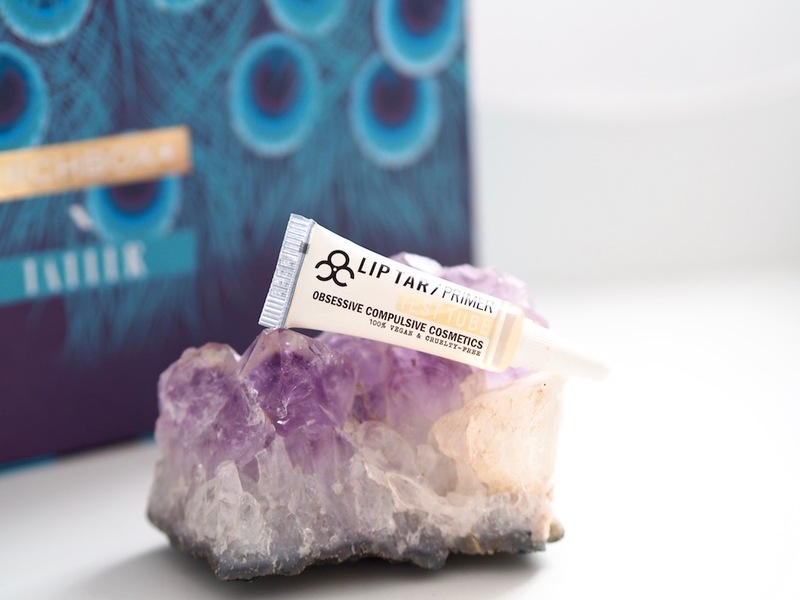 Infused with Vitamin E, Hemp and Peppermint Oils this primer is like a soothing balm you can swipe on your lips to keep your lippy in place for longer. So far I've only used this once and I found it had a bit of a plumping/tingling effect probably from the peppermint! In terms of long lasting durability it lays a great softening base for matte lips so as not to end up with crumbly dry lip syndrome! However personally found it a little bit sticky though and not a patch on my Kiko Milano lip primer! But I will give it another try as there is some great hype around this. 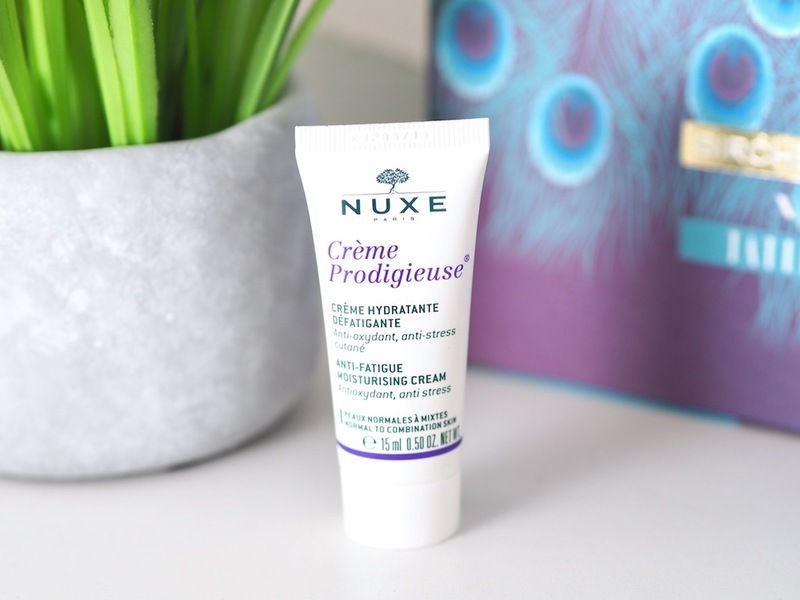 I LOVE a good moisturiser, especially when it's packed full of antioxidants and from a Parisian cult beauty brand. Now I find with a moisturisers that it takes a good few weeks to really see the benefits and changes that you want to see in your skin. However this creme is just far too greasy for me, I prefer a light water based moisturiser that won't upset my already VERY oily skin! But if you have dry skin I can imagine this will work wonders, plus it does smell pretty fantastic. 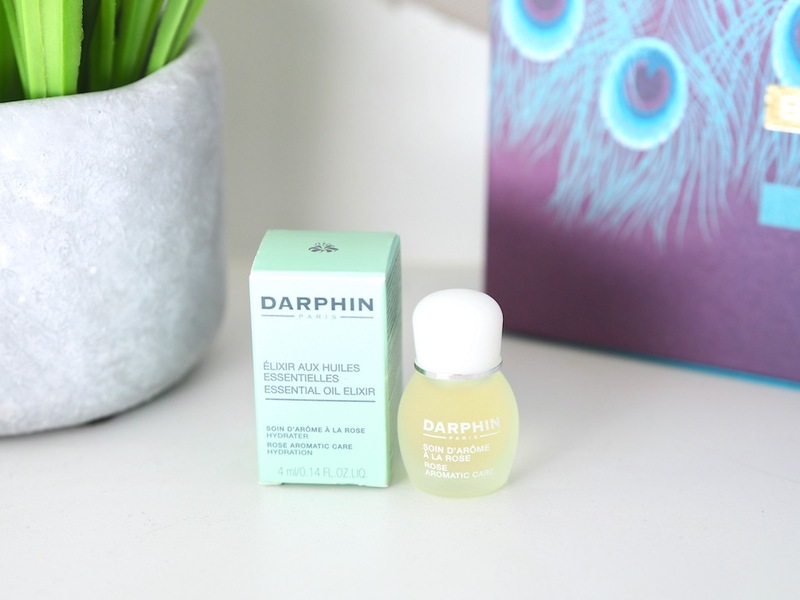 An essential oil elixir that just screams luxury and refinement. Now I have oily skin but even the shiniest of foreheads can benefit from a nutrient rich oil! I love warming it up between my fingertips and applying to under my eyes and across my forehead and cheeks. I've used this a few times in the evening and woken up to wonderfully smooth even skin the next day. So far this is a winner in my books and I'll keep testing it until it runs out, however at £45 a pop I'm still undecided as to whether this is the best elixir I've ever tried. IN LOVE with this little gem! 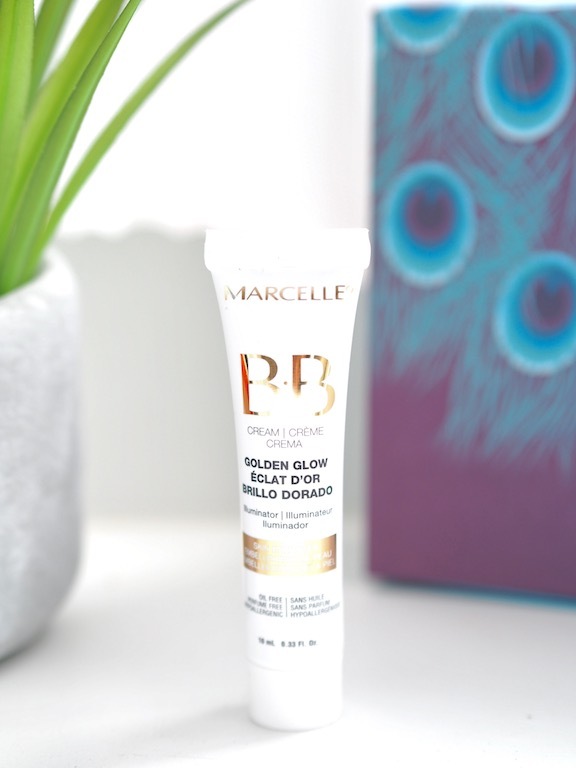 Everything you could ever want from a BB Cream. The benefits of a moisturiser whilst still giving a decent amount of colour and coverage to act like a foundation. The overall colour is actually a pretty good match for my skin too so I'm pretty happy with that! Not too greasy, slightly mattifying and the coverage is actually thicker than any other BB cream I've ever tried. For days when I can't be bothered with a full face of slap so far this has been my go to for an even smooth completion that wont look like I've just rolled out of bed! This may be a new beauty discover for my full purchase list! So this month's box has been a little hit and miss for me but I always love trying new products and any that I don't click with immediately I always try to give a second chance. Plus there's always my sister to swap with if I ever REALLY can't stand a product! Let me know if you're considering signing up and whether you want to see more monthly box reviews! SIGN UP HERE USING MY UNIQUE REFERRAL LINK AND RECIVE £5 OFF YOUR FIRST BOX FOR JOINING!